What is Adobe XD ? 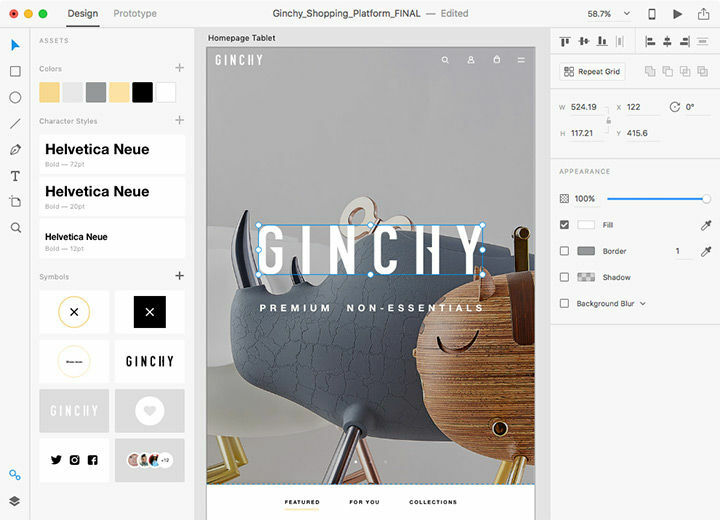 Adobe XD is an efficient UX software that can offer an optimized designing process.This program ensures that the entire design process is displayed in live preview on an array of platforms and devices.This helps to collaborate better with the team and customers.The Adobe XD allows you to smoothly run the design process and helps you to prototype the designs into a real working interface, saving the production time and cost.The interface used is relatively simple and the artboard space is quite large.The software has quick drag and drop facility that helps inserting images directly from the finder very easily.Creating elements to produce a decent-looking web design is possible. How much does Adobe XD cost ? The pricing for Adobe XD starts at $9.99 per month. Adobe XD has 4 different plans such as - XD Single App at $9.99 per month, XD Single App for teams at $22.99 per user per month, Creative Cloud All Apps at $52.99 per month and Creative Cloud All Apps for teams at $79.99 per user per month. 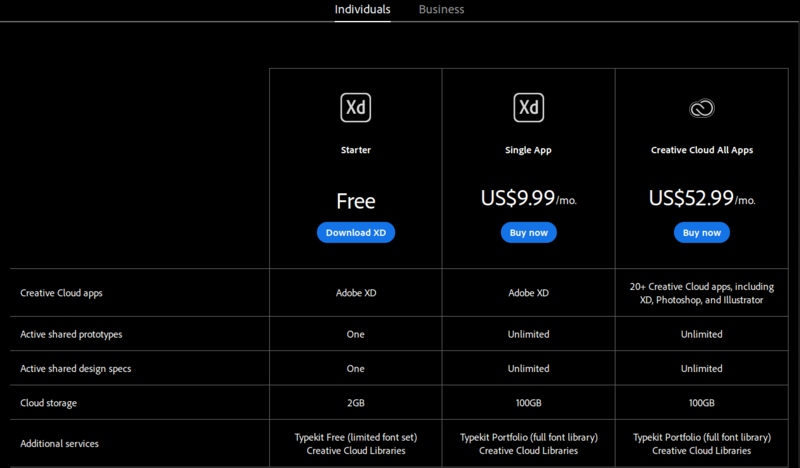 Adobe XD also offers a Free Plan with limited features. 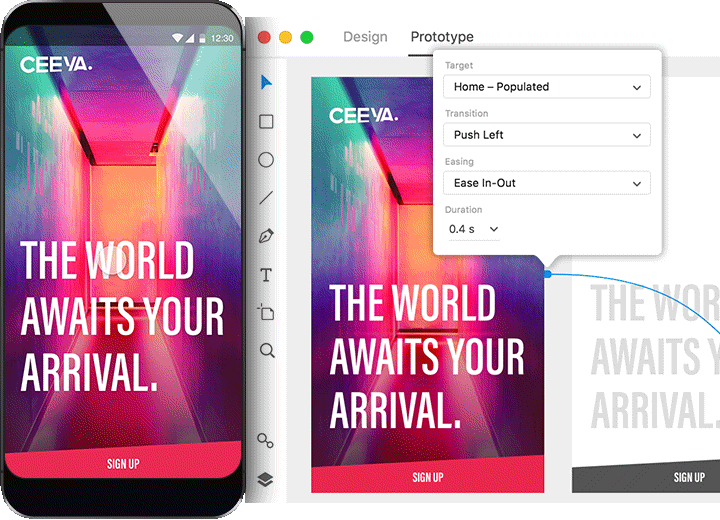 "Start designing instantly in contrast with other Adobe's tools"
Adobe XD is an excellent solution for designing and prototyping UX for blogs. The tool is well integrated with other Adobe software so that you can bring your files from Photoshop or Illustrator and XD will automatically convert them to the proper format. You are able to extend the application with plugins to speed up your workflow and add more powerful features. Farther, the software enables you to take benefit from timesaving tools (Grid) to quickly replicate objects, lists, etc. Also, groups of objects are automatically resized for different screens, so that manual changes take less time. AdobeXD has facilities that simplify the process of creating animations and designing smart assistants. Besides, the software is user-friendly, and you can start designing instantly in contrast with other Adobe's tools. The software is relatively new, so it tends to crush, and the issues aren't fixed quickly. Also, it would be great if Adobe XD generates usable code. I highly recommend the UX designing solution, as it's well-integrated with other Adobe's software and enables you to save much time, because of innovative, timesaving features. AdobeXD enables me to create posters and graphics for my blog and education projects. The software has many facilities that speed up and simplify the process. I don't need to devote time to make manual changes, as many processes are automatized. "Adobe -XD is a great tool"
Interface is very clean. So if you are used to Sketch it will be easy for you to work in Adobe XD. If you use Photoshop or Illustrator for interface design Adobe XD may seem a little deserted in the begining. It has much less functionality but just enough to design awesome apps or websites. No CSS export. Unfortunately there’s no way to extract CSS code from your design to simplify the work for developer. It is even possible in Photoshop (which is raster based) with the help of Zeplin plugin. But there is no such function in XD. If you have a Windows laptop and you wish to preview your prototype on your smartphone it just doesn’t work. My recommendation will be to talk with developers you are going to work with if they feel comfortable using XD. Some developers prefer Photoshop.If you are Windows user then sure you should start using Adobe XD instead of Photoshop. XD is a complete software for creating graphical interfaces. Perfect for both desktop and touch applications, such as smartphones and tablets. Certainly the best choice for a UI / UX designer, allows the import of drawing boards from both Photoshop and Illustrator and this greatly optimizes the workflow. I would add other touch gestures, like pinch and zoom, double tap, 3d touch. Missing the possibility to insert effects in the same table, without necessarily having to create others to insert the opening of a menu or the selection of a simple box. Furthermore, there is no export to pdf, which would still be a welcome option. I think it's the best choice, especially because with the latest upgrades the functions have increased, with the inclusion of the Auto-Animate function, with the timing and the possibility of installing plug-ins created by other developers. I create graphical interfaces for desktops and smartphones for work, and the creation of an interactive prototype is fundamental to allow the customer to understand the logic, the functionality and the interaction between the various screens that make up the project. There is also the possibility of sharing the various phases of the project, downloading the XD application for smartphones and tablets and displaying the real operation in this way. "Makes communicating with my dev team so much easier "
Anyone who has used adobe will take to this program in a flash (bad adobe pun, I know). The features are seamless, it’s fairly lightweight and has made working with my developers a lot easier. We love that the development team has an easy way to read and develop directly from an XD file and that assets are automatically embedded! The UX design aspects are great too for client presentations! We wish that XD had a bit more similarities to Photoshop as far as the auto-palette creations! We solved a problem with design to the development interface! "Adobe XD is the app for Web and Mobile UI/UX Designers"
I like that I can quickly create a website and app mockups and generate placeholder data for my content. This is really helpful because good website design should be focused on the design and not the text or photo content itself. My favorite function is definitely the repeating grid, which allows me to duplicate the same elements how I see fit and control the spacing between grids. I also like the shape masking function because it saves me time in which I would otherwise have to edit photos. I dislike that Adobe XD has a steep learning curve. I really had to spend a lot of time learning how to use Repeat Grids and other functionality. Once I learned how to use the tools, it becomes so much easier, but it was challenging at first. I would like for better training materials to be available. XD Snackables is a great resource for learning the basics, but even that is limited. My biggest setback though is that unlike other Adobe tools, the items are always aligned according to the top left corner of the element. I dislike this and I think there should be an option to place items according to the coordinates that I choose. Also, I often use rectangles to gauge spacing as text boxes aren't sized correctly most of the time. I highly recommend using Adobe XD because it is one of the most powerful tools for mocking up desktop, tablet and mobile sites and applications at this time. Right now, I am designing apps and websites for clients with XD. It has helped me to really understand how things should be properly designed and helps me show clients what the final product will look like. "Easy to use, capable of creating beautiful designs "
I love how simple to use this app is. 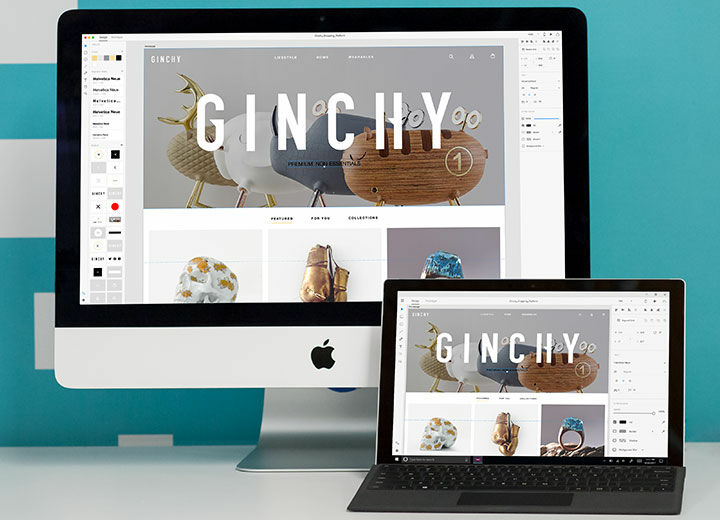 It syncs with your Adobe Cloud across all your devices. Sometimes it crashes on windows 10 and it is not supported in other operating systems like windows 7. Adobe XD helps me creating beautiful web designs to give a better idea to my clients how their websites can be benefited from a newer website. "Adobe Goes the X(D)tra Mile"
Adobe XD is a fast way to prototype and share the prototype with clients. I love that it brings in symbols and Library functionality from typical Adobe products like Photoshop. It's export tools are also great and it's nice that clients can comment on screens as they view them. For prototyping, there doesn't look to be a trigger for hovering. You can trigger a transition by tap, voice and drag, but not hover. This would be a BIG help for showing clients and usability groups the full experience that will be seen on the live version of an asset. I'm seeing more and more agencies using Adobe XD, so it's nice when edits need to be made that I can go right in and update a copy of the living doc, as opposed to working from flat assets or assets that were created and are editable via a separate app/tool (which would then require me transferring all of those assets into XD or another tool to recreate the connections across all assets). Adobe XD is the new kid on the block and though it's relatively new to the game, it gives a mean punch. I like how it has everything I could ever need in a UI/UX Design project all into one tool. The design and prototype tool tabs are simply amazing and the concept is very nice. I also like the new Auto-Animate feature, which instantly animates something without me putting alot of effort into it. I dislike how it does not yet have the collaboration tool like some of the other UI/UX Design software like Figma and it's one of the only reasons why a lot of users are not trying to make the switch to Adobe XD, however, it still has the sharing capabilities which are still very strong and i'm sure, the Adobe team is working hard to catch up. This product is simply amazing. There are alot of other controversial debates if you should go with other design software like Sketch or Figma, but Adobe XD is worth it, it makes life so much easier, it's efficient, quick, easy to use, and the learning curve is relatively small, so definitely worth it. I am on a team at a non-profit charities organization where we are constanly making Visual interfaces for our year round projects for humanitarian efforts. For example making websites and apps for walkathons, health fairs, blood drives, etc. And I've realized how quickly I been able to make interfaces with XD. Pros: Ease of use, easy to pick up, similarity to other programs in the Adobe suite, and build-in animations. Cons: Less ability to customize and create unique interactions and animations compared to other, more mature products like Invision Studio.